Franklin Dollars began production in 1948 to replace the Walking Liberty Half Dollar. The Franklin Half Dollar has a portrait of Benjamin Franklin on the Obverse and the Liberty Bell on the Reverse. Most circulated Franklin Half Dollars value fluctuates with the price of silver. BU/UNC Franklin Half Dollars will have premiums over silver value. Franklin Halves were in essence, the last real circulating half dollar. 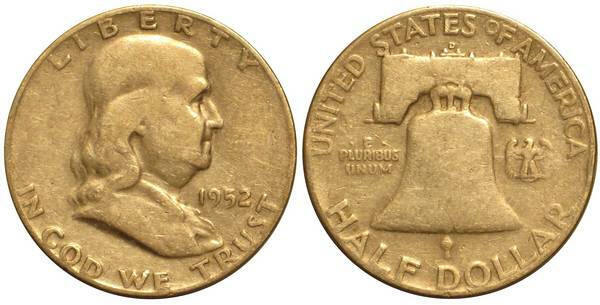 While the Kennedy Half has been in production for nearly 50 years, circulating halves ended with the hoarding of the Kennedy half. Below is a picture of a typical Franklin Half.